RAYNARD had another fantastic result with his 2nd place finish at IMSA on the weekend. Raynard went into the race feeling strong and confident of a great race. 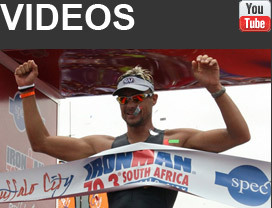 His training had gone well and he was ready to try and regain his IMSA title. The conditions on the swim were perfect, the sea calm and the temp cool. Raynard had a great start and was around the first buoy in the lead pack. Unfortunately he missed the break when Anton surged to the front, and Raynard fell back into the 2nd pack. He exited the water 2mins down on the leaders, which was not a great start, but he was out with Francois Chabaud – another strong biker. Onto the bike leg, and Raynard's strength. He worked well on the fist lap and Francois and him, quickly made up the 2 min deficit. They went through the 60km mark together, less than a minute down on race leader Stephen Bayliss. At 62km, Raynard punctured. All he could do was watch Francois dispappear into the distance. The puncture cost him 4 mins – the same time he would finish behind Bayliss at the end of the race. Once he had sorted out the puncture, he again worked hard to try get back up to the leader, Chabaud. He passed Bayliss and got to within a minute of Chabaud. He had caught 3 mins on Chabaud in less than 50km. A super-human effort. But, the effort would take it's toll, and he felt the affect shortly afterwards. Chabaud carried on at his steady pace, and opened up a 4min lead on Raynard off the bike. Raynard was in 2nd with Bayliss in 3rd 5mins down on Raynard. Having recovered, Raynard started the run feeling strong and running steady. Chabaud hung on to the lead all the way to the 30km mark, where Raynard passed him to take the lead for the first time. It didn't last long though, as Bayliss was right behind and passed Raynard with 7km to go. Bayliss went on to win by 4mins, with Raynard taking 2nd. Peter Schoissenger took 3rd and Chabaud 4th. It was a fantastic race to watch, with the lead position constantly changing. It was bad luck for Raynard to have punctured, but that is what makes an IM what it is, all the drama, all the heartache and all the excitement. He fought back after the swim, he fought back after the puncture and each time got back up to the lead. He is only human, and raced himself to absolute exhaustion to put on a magnificent show. Raynard is one of the most consistant IM athletes in the World. He has finished 19 IM races to date. He has 14 podium finishes. (5 wins, 7 second places, 2 third places).He has a further 2 Top 5 finishes ( 4th and 5th place), and 3 Top 10 finishes – 2 of them at the World Championships in Hawaii. That is a phenomenal CV and one that Raynard has worked extremely hard to achieve. Yes, he is disappointed at yet another 2nd place, but you learn a little more every time you race. He knows what went wrong and he knows where he went wrong, and he knows what he needs to do to get back into the Number 1 position. Stephen Bayliss ran a fantastic race and was the deserved winner on the day.